The customers don’t know what they want! The chef doesn’t know what to make! You don’t know what’s coming! You’re trying to collect satisfied customers. You do this by matching a customer card in your hand with a foodstuff that’s been flipped up. Also: The game is real time. You can draw your cards as soon as you’ve played them. The only thing the game stops for is when a player is ready to flip a new card! To play Yes Chef!, you need some space to spread out cards that everyone can conveniently reach. You need to play in real time. Players need to be able to hold their hands in secret, and there’s a lot of fast hand movement. The game doesn’t require you to talk but it’s likely people will make loud sounds with slaps of hands or movement of cards. Want to Buy Yes Chef!? For international customers, you may prefer to buy print-on-demand via DriveThruCards (the same printer we use for our local stock). You can buy Yes Chef! at DriveThruCards as a professionally printed card deck. Already bought Yes Chef!? 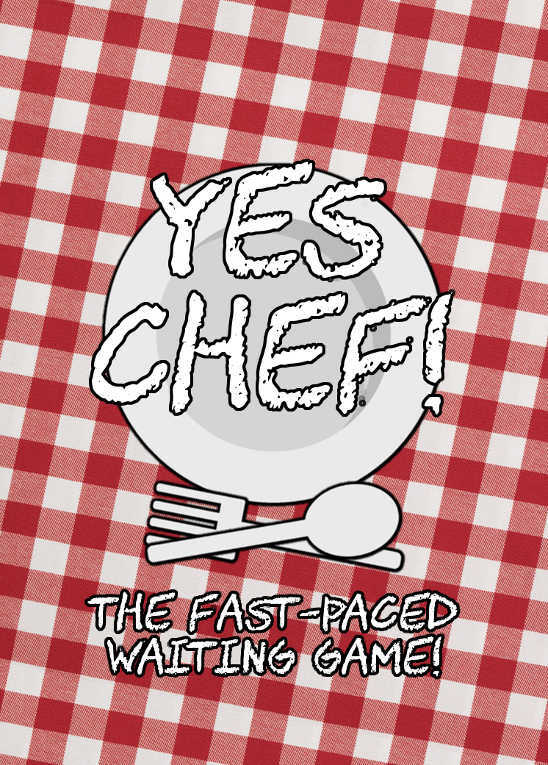 Download the latest revision of the Yes Chef! rulebook. You can also follow us to receive notifications of rules updates!